Want to head down to the café to work on your novel, but worried about spills near your precious iPad? Going to a meeting, and bringing your coffee along? Either way, the waterproof rubberized keys and the stylish synthetic leather of the Kensington KeyFolio ($79 as of May 11, 2012) should fit the bill--as long as you don’t intend to do a lot of typing. The KeyFolio’s rubberized keys are durable and spill-proof, and they won't leave a mark on your new iPad's screen, but they certainly take some getting used to. Pressing down to contact the sensor under the rubber requires considerable force, so I tired quickly while typing on these keys. The keys also don't spring back the same way that plastic ones do. The keys on any iPad keyboard case will be smaller than average, because the whole thing must fit within the width of the iPad. 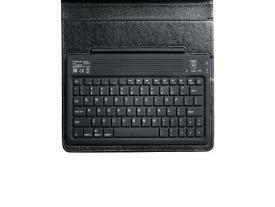 But the KeyFolio’s keys are absolutely tiny due to a raised, stitched lip that surrounds the edges of the keyboard. This design element forces the keyboard to be inset from the left and right sides by three-quarters of an inch. For all of the keys to fit, they had to be smaller. A lot of extra space surrounds the keyboard, resulting in especially small keys. The restricted space also forced some alterations to the key layout. The most annoyingly misplaced key is the apostrophe, which has moved to the bottom row where you would normally find the right Ctrl key. I hit Enter so many times while trying to add an apostrophe, but I can't undo the habit of extending my pinky just a little to the right as I would on a conventional keyboard. I found that the main ridge at the back of the keyboard holds the iPad at a great angle. If that doesn’t work for you, several smaller ridges offer more angles. You'll find a Micro-USB port for charging and a tiny on/off switch along the right side of the keyboard. The switch is recessed, so it's difficult to press, but at least you won't turn the keyboard on in your bag accidentally. A large connect button on the top of the keyboard makes pairing easy. Three LEDs beneath the connect button indicate pairing mode, charging, and whether the keyboard is on or off. Key-layout annoyances aside, the case is quite nice, although bulky. The synthetic leather feels soft and looks stylish. The case seems very sturdy, and it holds the iPad securely enough that I could use it in my lap as well as on a table. The bulk means that the Kensington KeyFolio may be a case that you'd consider only if you absolutely needed the keyboard. The good news is that you insert the iPad from the top--and while the fit is good, it's not too tight, so you can easily pull the iPad out to move it over to a slimmer case for keyboard-free occasions. The durable rubberized keys get the job done, but the case is bulky and the feel of the keys takes some getting used to.